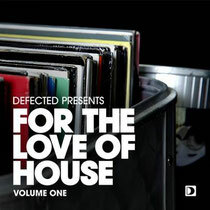 ‘Defected Presents For The Love Of House Volume 1’ is the first of a new series of digital albums from Defected Records focused on classic, genre defining tracks rarely made available for digital consumption. Working closely with seminal record labels including Trax, Nervous, FFRR, Slip N Slide, Soulfuric, Strictly Rhythm, Classic and Warner as well as digging deep into the vast catalogues under the Defected umbrella. The series will chronicle a genre as well as hopefully educating a new audience on some of the finest examples of house music and the roots of an undying scene once again enjoying heightened popularity. To begin to understand why house has stood the test of time is, in part, to understand what makes a classic house record. Whether they know it or not, most people’s love of house stems from and is still influenced by the classic house sound, and it is that sounds that this new series aims to celebrate. Volume 1 offsets seminal moments from Joe Smooth, Everything But The Girl, Todd Terry and Mr Fingers with collectors cuts that stayed relatively more underground. The release comprises 30 quality tracks plus two bonus DJ mixes and is out April 1.